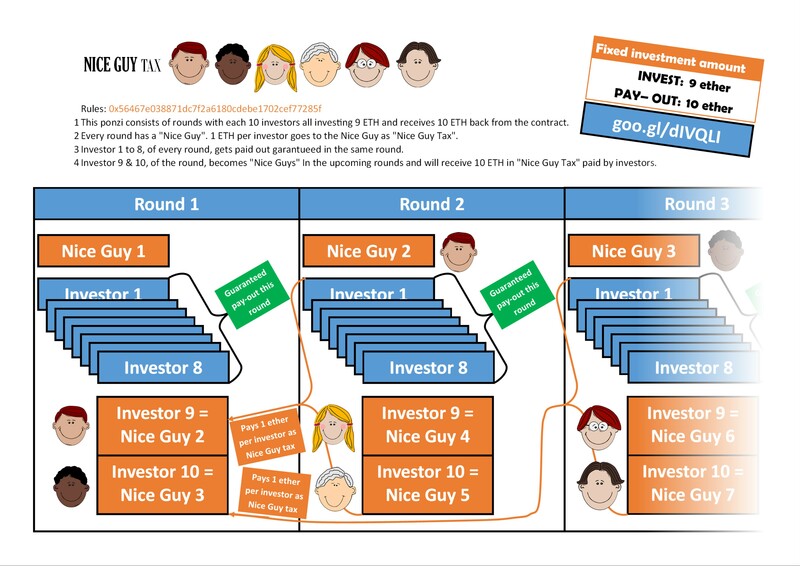 Nice Guy Tax is a new "rounds based" ponzi where investors in the same round gets guaranteed pay outs. 1 This ponzi consists of rounds of 10 investors all investing 9 ETH and receives 10 ETH back from the contract. 2 Every round has a "Nice Guy". 1 ETH per investor goes to the Nice Guy as "Nice Guy Tax". 3 Investor 1 to 8, of every round, gets paid out garantueed in the same round. 4 Investor 9 & 10, of the round, becomes "Nice Guys" In the upcoming rounds and will receive 10 ETH in "Nice Guy Tax" paid by investors. First Nice guy: Me, much nice! I won't invest in my own contract any further, unless it goes like a train.